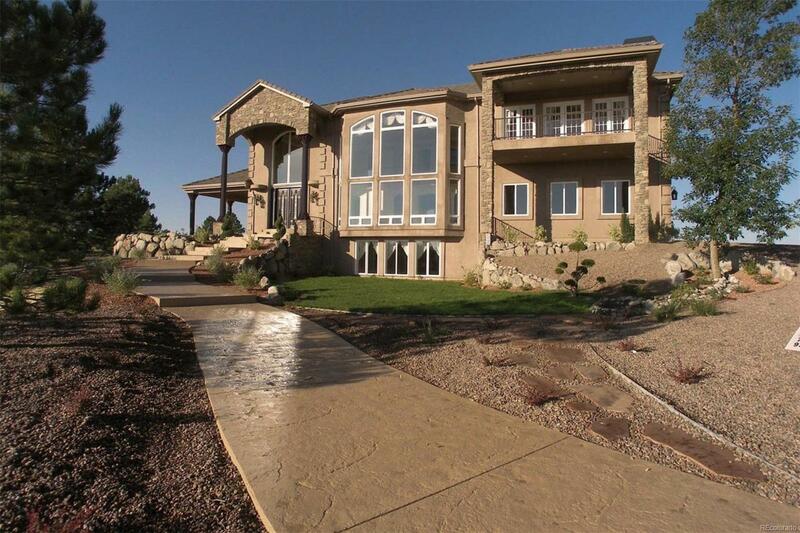 Gorgeous custom estate on 5.22 acres with spectacular views of Pikes Peak from almost every window! Unobstructed views due to large acreage properties to the east and North. Zoned for horses with approx. 6458 FSF with 3 bedrooms & 5 baths. 2 Story Great Room with magnificent floor to ceiling windows, custom drapes, fireplace & art niches. Amazing attention to detail throughout in the hand-troweled walls/ceilings, Italian marble & hickory hardwood flooring. Luxurious Master Suite with fireplace, en suite spa 5 piece bath with fireplace, heated marble floors, large walk-in closet, 2nd laundry & private 20'x 11' covered deck w/outdoor fire pit. Gourmet kitchen features granite counters, beautiful cabinets, breakfast bar & center island. Laundry on main & upper levels. Finished lower level w/wet bar, media center, bath & possible 4th bedroom. 3 decks/patios including a 34'x 16' covered Veranda.